"This is so easy and delicious. Serve warm with a tossed salad and Italian bread." Fill a large pot with lightly salted water and bring to a rolling boil over high heat. Once the water is boiling, stir in the linguine, and return to a boil. Cook the pasta uncovered, stirring occasionally, until the pasta has cooked through, but is still firm to the bite, about 11 minutes. Drain well in a colander set in the sink. Heat the olive oil in a large skillet over medium heat. Season the chicken breasts with salt and pepper. Add the chicken and garlic to the skillet. Cook and stir until the chicken is no longer pink in the center, 7 to 10 minutes. Stir in the white wine. Toss the pasta with chicken in the skillet until the chicken is evenly distributed. This was super easy and quick to make, but like the other reviewer said, as written it is a bit bland. If I make it again, I will flavor it up a bit with spices and herbs that my family enjoys. i've done this often when pressed for time. it's ok, but needs added spices. black and red pepper, some basil or whatever you have on hand. as written, it's a bit bland. I seasoned the chicken really good and added some brocolli. After adding the pasta to the pan, I stired in a 1/2 of Clearman's Original Spread. That made it amazing! 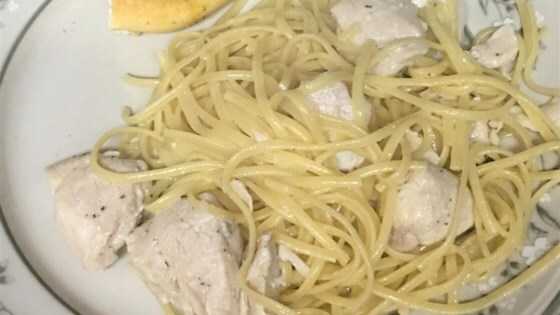 Great easy pasta dish that the kids love. I tend to add a little more garlic since I love garlic. I usually let the cooking wine mostly cook off so it's mostly olive oil to coat the chicken. It was very bland. I will probably make again and doctor it up.